There’s been a lot of interest in Vin’s in-ground composting experiment (look for the blog post just before this). This is my quick and dirty version of the same idea. Simple. Cheap. Quick. What more could you want? The rather shabby looking barrel above has done service as a water barrel in my greenhouse for a few years. When I went to fill it this spring it leaked shamelessly from a crack in the bottom. 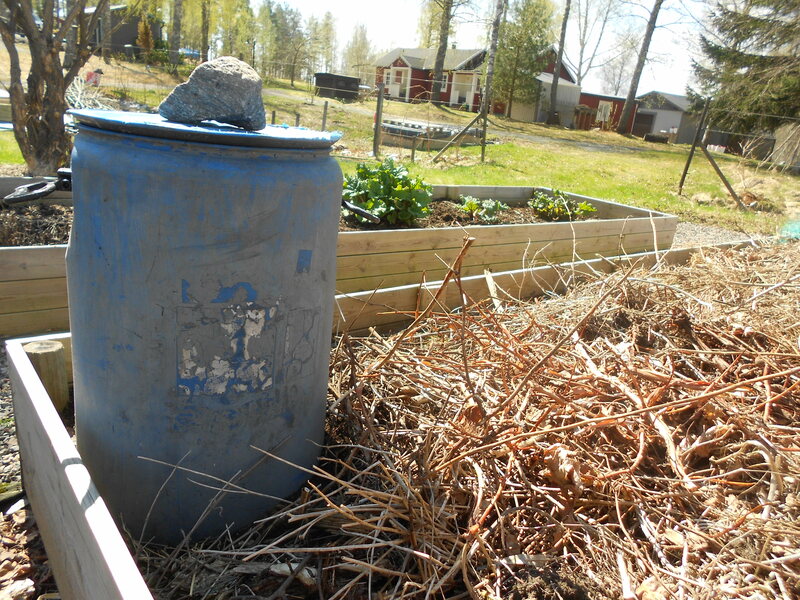 I found an (equally shabby) barrel to replace it but as I was heading for the over-and-out pile that’s going to the tip soon I got the idea of giving it an extra life as a soil maker. Out with the saw (just a plain old household saw) and off with the leaky bottom. That’s the bottom bit you can see there on top of the barrel, it turned out to be just the right size to serve as a lid. With a good-sized rock on top to stop it blowing away. Having lopped off the bottom it was then easy to sort of screw the barrel down into the garden bed. Under all the garden scrap you can see in this bed there’s actually a bit of soil: I’d like to build up the level somewhat and also to improve the nutrient level there. So my idea is to dump the occasional Bokashi bucket into the barrel, top it with some paper scraps or a handful or two of the garden scrap. Let the worms do their work and come up and get it! In a couple of weeks it’s pumpkin planting time here, the frost risk is over for us 2nd week of June. I have a few pumpkins and squash coming along in the greenhouse so I thought I’d plant them right alongside the barrel and see if they can’t take up some of the nutrients coming through that channel. Hopefully they’d like to sprawl out over all the compost scrap in the bed. Transplanting a rhubarb here was another option but to be honest I can’t be bothered — they’re so happy where they are. So, yes, it’s an experiment, but having fiddled and fixed with all manner of strange Bokashi experiments over the last years I haven’t got the least doubt this will work just fine. The nice thing is that when it gets boring with the barrel in that spot it’s easy to move elsewhere. A sort of mobile composting unit, quieter than a chicken tractor but the same idea. Perfect if you have clay soil that you can’t get a spade into and so need to go up instead. Love to see your versions of this sort of thing. Has anyone got something going that’s even shabbier than mine??!! I’ve got almost exactly the same thing going, except I planted the broken rain-barrel out past my fence. We’d left the rain barrel out over winter without draining it, a couple of years ago, so the bottom belled out and cracked when the ice froze. Last spring, we turned it into a soil factory – layering bokashi stuff with garden waste and low-quality soil, and it did make decent compost for us. It’s definitely worth a shot! I love this idea, but I have a very tiny garden, so no room for this. However, I do bokashi, which I add to my garden compost bin, and keep worms, which eat some bokashi and supply vermicompost to add to the mix. It’s a three-way street at our place! I was wondering, would it not be possible to use a container with a tight fitting lid (would a rubbish bin be tight enough???) and make the bokashi directly in the garden bed? There are two things that I don’t like about the normal way of making bokashi – opening the tight lids and that the buckets are too small. This would work fine Heike! You have kind of given me an idea. In my very small garden I have two plastic, bottomless compost bins a bit like small garbage bins. They just happen to be placed under my Japanese sour plum tree as that is the most inconspicuous place for them. The last five years or so, I have noticed bumper crops of plums, some of them almost twice the normal size! Well, after reading these posts, I think if I set up a similar system as you have described in a small bin under my yuzu tree, using bokashi, it would have a very good effect on the tree!. Fruit trees could have their own small, private feed bin under them. It wouldn’t have to be big like a compost bin, because the size is not important for bokashi. Maybe a plastic kitchen pail would work. Brilliant idea! Love to hear more about your results later! Actually you’ve got me thinking too, one of the big problems people have is how to “get rid of” all their bokashi in the winter (here in Sweden you can’t dig), it could pay off to have a few of your tree-feeders in strategic places ready to empty winter bins into. A number of problems solved in one go. Previous Entry Vin’s Bokashi experiment in Florida. Perfectly. Simple.